The Dead Sea Scrolls refer to a collection of about 900 documents, many of which are fragmentary scrolls written in Hebrew, Greek and Aramaic, that were discovered between 1947 and 1956 in caves near an ancient settlement called Qumran, near Jerusalem. The documents include some of the oldest known copies of portions of the Old Testament, as well as several writings from a religious group called the Essenes, which existed in Israel from about 200 BC to about 100 AD. (That is about 2200 years ago to about 1900 years ago). Some scholars have attempted to show that there is a connection between the scrolls and Christianity, with an implication that instead of being the word of God, the New Testament supposedly grew out of the writings of the Essenes. 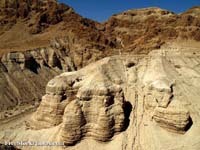 However, the Dead Sea Scrolls do not contain even a single mention of Jesus, according to several sources. The relevance of the Dead Sea Scrolls for better understanding Jesus and the Gospels is a controversial topic. In this chapter, we have emphasized that there is no direct relationship between Jesus and the scrolls, and none of these ancient documents was written by or for Christians as far as we know. Attempts have been made to find direct connections, but in many cases these are speculative, sensational, or bizarre (e.g., John Allegro and the sacred mushroom, Barbara Thiering's peshar technique, and the scrolls and the New Age Jesus). - "The Meaning of the Dead Sea Scrolls: Their Significance For Understanding the Bible, Judaism, Jesus, and Christianity," by James VanderKam and Peter Flint (Hardcover - Dec 1, 2002).